The template image is captured from a 1024 pixels wide screen. This template has 3 'sidebar' columns below the post column. 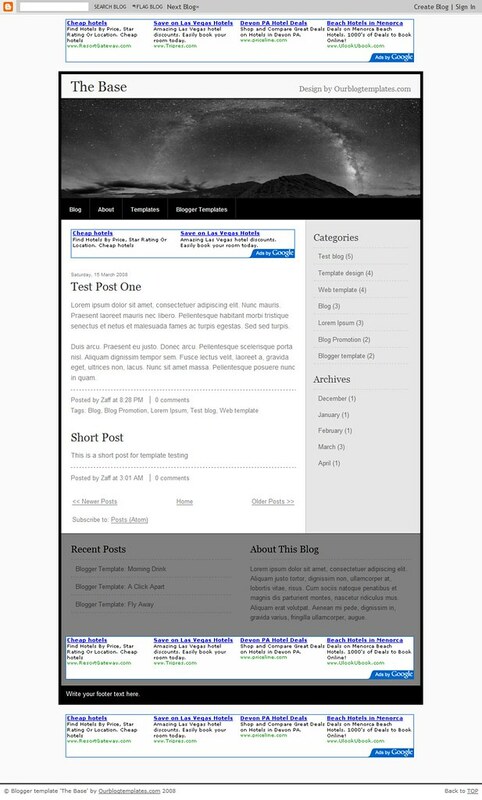 The theme is photoblog - the post column is wide without any other columns next to it. This style is especially great if you want to build a photo blog with lots of large photos and images. 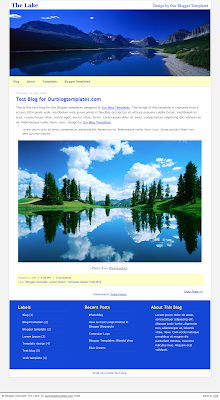 Click here to learn how to post large photos and images in your blog. Header image credit: adapted from eWallpapers. If you want to use your own image for the header, the image has to be 920 pixels wide (with any height) to fit the header nicely. Click here for more helpful links on template installation guides and instructions. Nice natural template. Download this beach template free from Promotional codes. I installed this template well. But it shows "flickr image not available" in the background, eventhough I set the background colour to black. It's the same problem with other 1-column photoblog templates on this site. The photoblog templates on this sites had a Flickr image background once, which no longer show when the template is uploaded into the blog-site and instead a message saying "this Flickr image is no longer available" appears in the background. This makes the template look shabby. Go to the HTML code-box, after uploading the template, go to the section where it says Global template and find - $bodybgColor url. You need to delete the flickr URL from the bracket that follows and save the template. Go to advance colour editor and choose a colour to appear in background if you don't like it white. it is really cool....i'd love this template...awesome! You have provided a very informative data in your new post. A long time I try to http://write-my-essay-online.blogspot.com/2014/10/which-essay-writing-service-should-you-use.html but I never successes, but when I saw your blog then I have decide I take help from your post. Your post is very beautiful and stunning which solve all my problems. It has simple and moderate Protection cover for you to cover debacles, mishaps, burglaries or different dangers. Or more all whether you take your auto from Auto Employ Alghero or Auto Procure Ciampino, twin town of Rome, you can drop it from the last city you plan to visit on your present Italian visit. Detox giảm cân như thế nào? Giảm cân bằng chanh mật ong có tốt không? giảm cân bằng mật ong có phải là cách tốt nhất và hiệu quả nhất cho phụ nữ? This template looks very beautiful. Nice pic. It helps me relax and find myself.